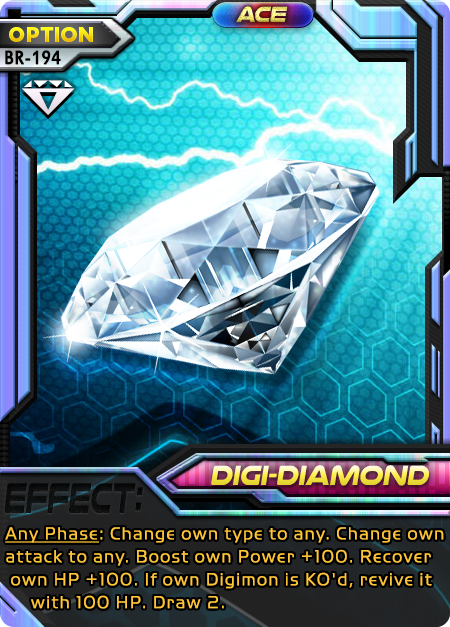 Digi-Diamond—the Swiss-army-knife of Ace cards. What’s good about it: Digi-Diamond is currently the most versatile Ace. “Any Phase” timing extends the number of cards you can play per turn (and is extremely powerful and limited). Changing your attack in the support phase is powerful, since you can evade a counter or buff a different attack. Changing your type can help you get around “x3 VS” and aid in evolution. HP Recovery and the revive effect both help you keep your current Digimon, for evolution purposes or dealing a finishing blow (best on the opponent’s turn). Draw 2 is icing on the cake that make this one of the more powerful cards and the Ace you can’t go wrong with. What’s bad about it: The power gain, like every other effect of Digi-Diamond is small. Each Individual effect has specific uses, and most of them don’t really assist each other—you’re usually going to play this for one of its effects at a time and just get the others as nice bonuses. Tips: Digi-Diamond is a good starting point for the deck’s Ace if you’re not sure what it needs. Playing Recycle effects lets this card shine, allowing you to use it for whichever effect is the most helpful now and then recycle it back for later. If you find yourself using Digi-Diamond for the Draw 2 most of the time, use a different Ace. Other Aces do much more than just draw—yours will get outpaced by them. Witchmon is a Champion that Boosts Power and can evolve to types. What’s good about it: “ to zero” is one of the rarest abilities in the game—it shuts down Cross-reliant Digimon and strategies like “Drain”, “x3 VS” and “1st Attack”. “Attacks cannot be countered” is powerful and not found on any other champions, so far. +30P is higher than average, helping speed up evolution. Evolving to type lets you play “Angewomon” for “Mastemon” decks, and other / crossover decks. What’s bad about it: It’s not fully , so it can’t evolve from . Witchmon’s support reduces both and to 0, making top-deck supporting risky. Tips: This card is a tactical choice for your Destiny Zone If your partner is BKGatomon. 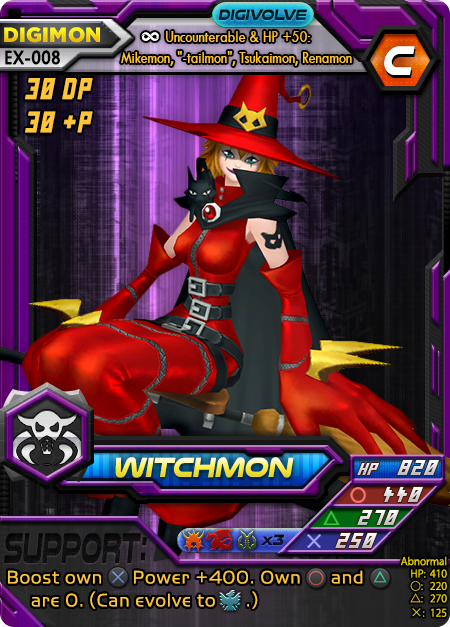 Witchmon’s support ability plays well with Cross abilities like “x3 VS”, “1st Attack” and “Drain”. Concert Crash makes your power the same as your HP then halves your HP. What’s good about it: It gives you Crash without your Health being reduced to 10. Unlike Crash, if your HP changes your power will not. What’s bad about it: The HP reduction happens before any attack, making it harder to use on your opponents turn. The card is dangerous to use when your HP is low. 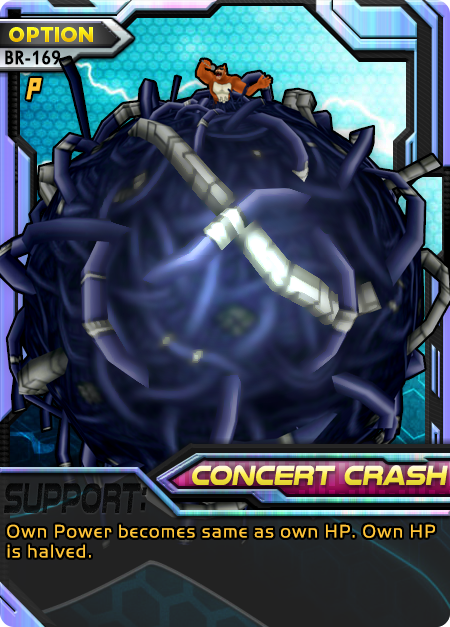 Tips: It is best to play this when you can get a KO—high health Digimon make this far more likely, while Digimon with First Attack make it easier to use on your opponents turn. Decks that are specialized for Crash can use this to survive Crash attacks they otherwise wouldn’t. 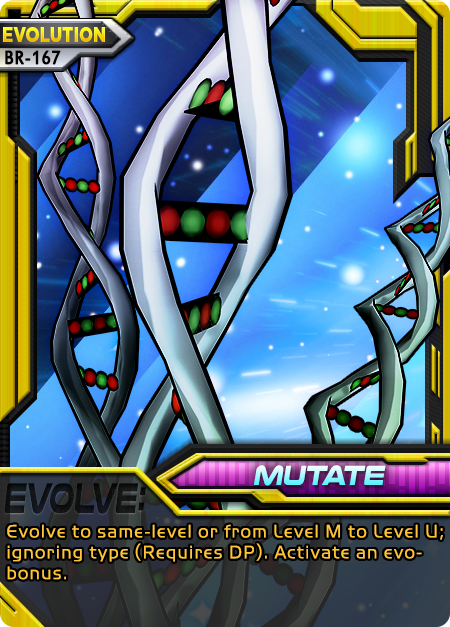 Mutate allows you to evolve to the same level and heal. What’s good about it: This card allows you to refresh HP (with a bonus), evolve from the Abnormal state, and removes Type restrictions when evolving. You can quickly evolve to a Champion or Ultimate by playing one as abnormal, then “Mutating” into the same level. What’s bad about it: Mutate requires DP, gives no discounts and you can’t change level with it. Tips: It is absolutely great for stalling strategies, letting you refresh your Active Digimon and raising your HP. It can also help you come back after your digimon gets KOed. 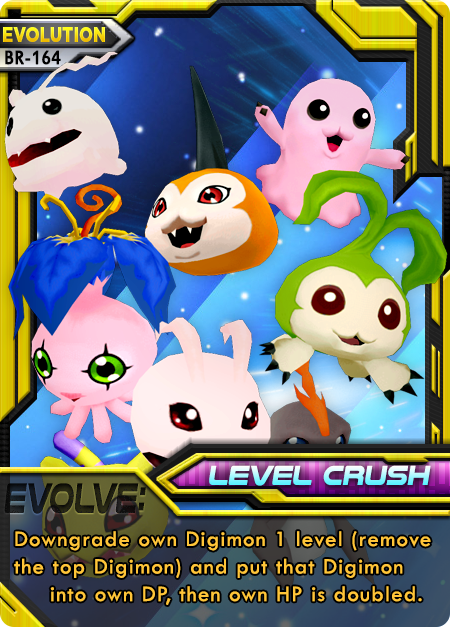 This card allows you to run a higher number of C/U Digimon—especially when paired with other Evolve cards like “Level Crush” and “D-link”. 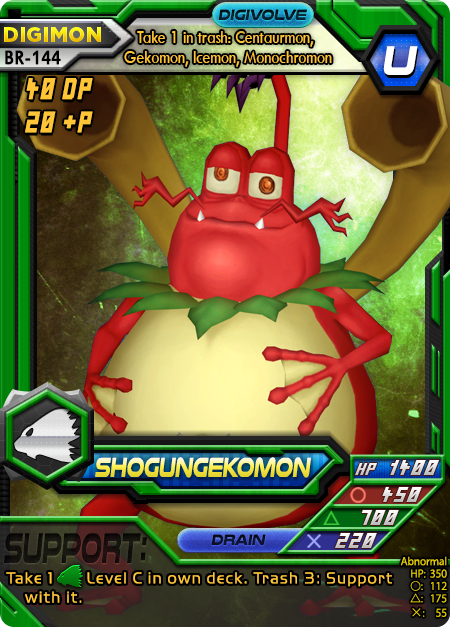 ShogunGekomon, Is an Ultimate level Digimon with an exceptional body and a support that searches for a Champion. What’s good about it: Shogungekomon’s strong combination of a good HP, solid attack power distribution, and the powerful attack being , makes it a difficult opponent to contend. Adding Drain to this mix means the Shogun can stall and support for quite a while if it becomes outmatched. Generally, any Digimon with a high is tough to beat since you can’t rely on as many tricks. Combine this with the ability to search out Champions to charge DP, exploit Nature’s tactical, well, nature, and you have yourself a recipe for a solid toolbox. What’s bad about it: Having Drain is a two-edged sword most of the time; it usually means your printed HP is going to be a bit lower than comparably-costed Digimon. Shogungekomon is no exception here—1400 HP puts him right about where a 40 cost Ultimate with Drain should be and no higher. This means most other Ultimates of the same cost are going to steamroll him if he doesn’t commit to Drain in order to hang on until an appropriate support comes along to assist. Additionally, the Champion you search is one your opponent now knows about, so it could be played around if you choose poorly or get stuck in a bad spot. Tips: Keep an eye out for “Also counts as type” in other printed frame colors like Monochromon. Make sure you load up your deck with a few reliable Champions that are hard to punish, such as Drimogemon, Galgomon, or Garurumon. Make sure you set up a clear role for evolving to Shogungekomon—using the DP bonus, DNA or neither; otherwise your Champion selection might interfere. Don’t get caught in a Drain-lock for too long, where you can’t afford to play anything but Drain and nothing is fixing it—take a few mulligans to get out of it and start coming back. Level Crush! An evolution card that lets you evolve downward and double your HP. What’s good about it: It more than refreshes your HP with very little card investment, keeping you going on the same active far longer than usual. It also lets you use your Mega and then evolve when you get low—forever denying the 2 KO points that Megas provide. What’s bad about it: This card is practically useless when you’re losing, or stuck on Champion. Using it while behind in points could propel you even further behind if the opponent has a solid evolution strategy. The fact that it takes your evolve for the turn can really slow down your game. Tips: Level crush is best used when you’re running Champions with a lot of health. It is best to avoid using it until you’re low on HP or are above Champion. Having Champions with good abilities like Jamming and Shatter can send the game spiraling into a never ending slog for your opponent. Mix with the card “Mutate” for best results. Chainsaw. An Option played in the Support phase that triples your power. Then after the battle, if you’re still alive, you go straight to 10 HP. What’s good about it: What’s great about this Option is how it really helps come back from an absolute pummeling. Especially if used on the opponent’s turn, so you go into your own turn ready to evolve and heal yourself back up. What’s bad about it: It’s essentially useless with a Drain ability since the 10 HP occurs at the end phase, and doesn’t work at all with Crash or Counter, but few things do. 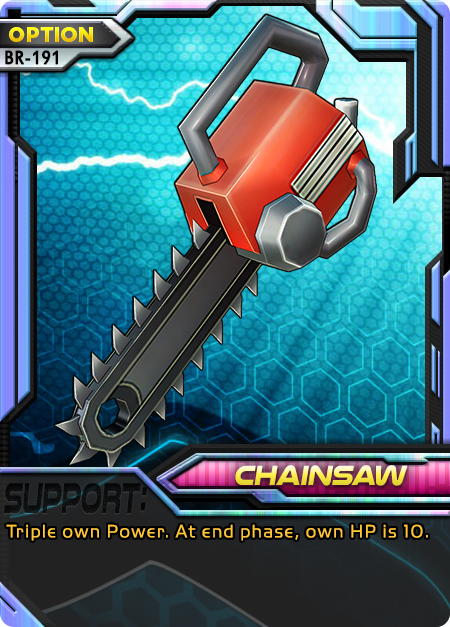 Meaning Chainsaw is for playing it straight: using , or an attacky-. Tips: You can get massive numbers if paired with a that has “x3 VS”, which will sextuple them. If used like this versus a Mega level, you can earn 2KOs for the one you will inevitably lose. Securing a dominant position with Chainsaw can only be done if it’s your opponent’s turn when you play it and you can evolve next turn. Otherwise, you’re just setting yourself up so they can knock you down.